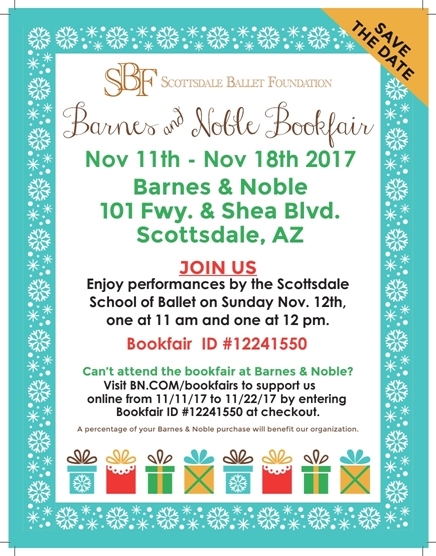 When: Sunday November 12th 2017 11:00 a.m. &12:00 p.m.
Stop by the Barnes & Noble at 92nd Street and Shea Blvd to see the dancers from Scottsdale School of Ballet on November 12th at 11:00 a.m. and 12:00 noon and at 1:00 pm perform excerpts from the upcoming 2017 Winter Festival! Can’t attend the bookfair at Barnes & Noble? This is a nationwide event so please pass the flyer on to everyone you know, FLYER HERE in PDF. They can make purchases at any Barnes and Noble, in all stores from November 11th – 18th or online. Just visit BN.COM/bookfairs to support us online from 11/11/16 to 11/22/16 by entering Bookfair ID #12241550 at checkout. A percentage of all your Barnes & Noble purchases will benefit our organization.